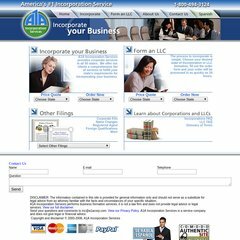 Topics: Incorporate, and Form An Llc. Age: The domain is 14 years and 11 months old. 117 users visit the site each day, each viewing 1.80 pages. Godaddy.com Inc (Arizona, Scottsdale) is the location of the Microsoft-IIS/6 server. It has 2 DNS records, ns30.domaincontrol.com, and ns29.domaincontrol.com. It is written for ASP.NET language.